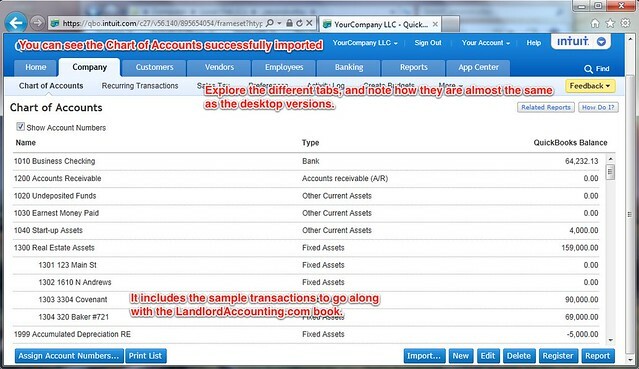 Below is an unedited excerpt of Chapter 1 of our training guide for landlords to use QuickBooks. If you like what you see, you can order risk free and download everything immediately. Want a hassle free refund? Ask us for your money back within 30 days. 1.04 When is a Good Time to Read and Implement this? The actual book is in PDF format and comes along with a sample company file and a template data file. You can print the eBook, no restrictions. This book is designed for people involved in the purchase, management, and tracking of rental homes or apartments. It is my hope that this book will aid you in your understanding and application of QuickBooks for a real estate investment company. Other individuals such as property managers, commercial landlords, or developers have found this book helpful too. I appreciate your feedback and success stories as your read this over. Share successes at LandlordAccounting.com/your-story. You will understand how a real estate rental business works and the associated terminology. Ideally you already either have your own corporate entity, or are in the process of forming one. It is essential for you to have a strong understanding of the financials of your company, even if you hire a bookkeeper. We’ll help you learn those. Use QuickBooks to enter data properly, and you will be able to analyze your business, make decisions using accurate financials, and save an enormous amount of time. I recommend starting at the beginning to understand the underlying accounting principles. This applies if you plan to enter the bookkeeping data yourself, hire a third party, or train an employee to do it. You will learn common bookkeeping activities a landlord will encounter while dealing with properties, tenants, and sorting out financing. This manual is an education tool to bring anyone involved in the residential real estate rental market up to speed to manage the bookkeeping and property management using QuickBooks. The basic concepts and terminology will still apply to older or newer versions. Throughout this book I will use a sample data file of an LLC. Your entity, state laws and individual needs may differ. Get a competent accountant and attorney and go over what you do in QuickBooks. Large public corporations keep two sets of accounting books: one for tax purposes, and the other for management decision making and analysis purposes. This manual assumes you keep one set of books and use one QuickBooks file. This manual is not a replacement for your accountant. There are nearly 10,000 pages of tax law which change yearly. Please interview many accountants and choose a competent one with extensive experience with QuickBooks and real estate business owners like yourself. When you’re ready to implement QuickBooks for your property management, make sure your accountant supports you and is familiar with the program. Most who deal with small businesses are, and may even offer you a discount for using QuickBooks. This manual is not a replacement for your attorney. Consult your attorney. Do not consider anything in here legal advice. Read now! Implement slowly. Commit to reading this every day and playing with QuickBooks until you master it and are ready to try it on your own company. I invite you to visit the free forums at www.LandlordAccounting.com/forum on a regular basis to ask questions and strengthen your knowledge by helping answer other people’s questions. It is suggested to not try this on your own “real” books at first. Instead enter transactions that are similar to what you would incur in your company. Then try generating the reports you need and have your accountant look it over. Start using QuickBooks exclusively when he or she approves your setup. Like what you’re reading? Order our full training today for the 200+ page ebook and QuickBooks data files. I have been an investor, landlord, consultant, and business owner. I firmly believe in the importance of understanding the financial health of one’s companies. Some investors just want to make the next investment, and they insufficiently manage, optimize and track what they already have. Through this book and the accompanying company files, you will enter property, tenant and management company transactions, automatically track tenants’ late fees, understand your business’ financial health, and save time. When you need to click a link or a menu item on the screen those will be bold. 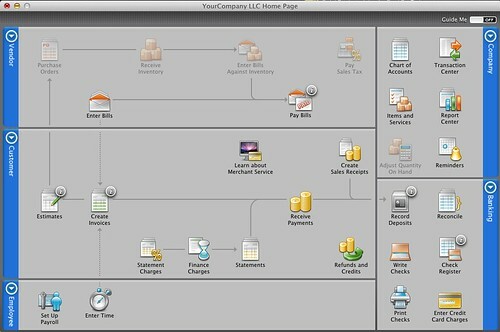 For example, to open a company file in QuickBooks, click File > Open Company…. As you read you will have questions, I try to answer them all here in FAQ’s. If I don’t answer your question, don’t hesitate to search the forum at www.LandlordAccounting.com – someone else probably had the same question and it was answered. There will be times that you need to use extra care, we will highlight these moments with a caution. When a related topic is relevant to current discussions, the See Also box will refer you to these other topics. From time to time there will be additional information that does not merit inclusion in the main text area, but some people will enjoy reading it. A sidebar will pop up on the side and delve into more details. Quicken is a personal finance product for individuals. It uses single entry accounting. 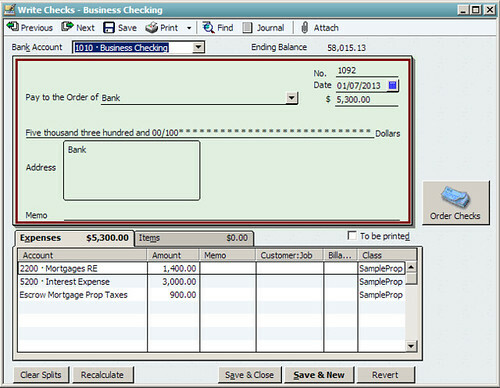 Amounts are usually recorded in column form, like a checkbook register. Entries include the transaction’s date, a memo, and the amount of money involved. QuickBooks is an accounting solution for small businesses. It uses double entry accounting. Each entry has two accounts (sometimes more with “splits”) associated with it. In the simplest case this means one account is where the money came from, and the other explains how it was spent. For instance, you use cash to buy a new property. The two accounts involved are cash and a fixed asset account for the property. Money came from the cash account and it went to the new asset. Details on double entry accounting appear next chapter. QuickBooks makes it easy and once you understand it, you will be grateful of double entry’s power. Businesses need more detailed financial reporting than individuals. QuickBooks transactions are recorded on a dual impact on the financial position (change to balance sheet) or operating results (change to income statement) or both. You cannot deposit money from a security deposit into a checking account (increasing an asset on the balance sheet) and stop there. You also need to recognize that you owe this back to the renter (and add a liability on the balance sheet). QuickBooks has fields to collect information about your tenants, services, vendors, inventory, late fees, etc. You can invoice your tenants, track accounts payable and rent receivable, make journal entries, create advanced reports and more in QuickBooks. Many of these functions are not available in Quicken. When you start to use QuickBooks for your business, it should have no relationship to your personal finances. If you commingle the two, you may have serious consequences with the law or tax authorities. It is essential to keep separate personal and corporate finances. 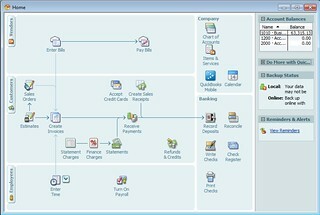 If you are migrating records from Quicken to QuickBooks, refer to the integrated help on this topic in both programs. Many of my customers have first tried to use Quicken Rental Property Manager; however it did not work out well for them. Because it is designed to be so “simple” many real business scenarios just aren’t supported. QuickBooks’s is still our best bet. Here is what some of my customers had to say. Note: I recommend you use QuickBooks, not Quicken Rental Property Manager. Below are complaints of people who tried to use Rental Property Manager. (Later they were delighted once hey started using our training – testimonials ♥). “I tried the Quicken PM [Rental Property Manager] – very busy and very non- intuitive.” – C.B. “We are presently using Quicken Rental Property Manager 2.0. It is an entry level program, but quite an improvement from our previous excel spreadsheet system. 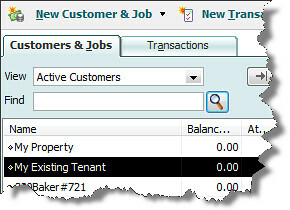 Quicken RPM 2.0 does not provide the ability to compare expenses, profits, between individual units/tenants on our property’s.” – D.W.
“Checked with my accountant on this one and turns out this is actually a QUICKEN product so it doesn’t have the double entry system and some other necessary business features.” – C.K. “The new software [Rental Property Manager] did not produce any late notices and is not able to be interfaced with Quickbooks.” – E.E. I hope you too will turn to QuickBooks since it is a real business accounting software package. With this guide and our data files, it is not hard to set up, and you’ll quickly be moving in the right direction. QuickBooks is the number one bestselling small business accounting software in the world. It is extremely easy to use, very powerful, adaptable, loved by accountants, and it creates a multitude of detailed reports. It saves you time, money and headaches. You will be able to get the information you need out of the program through customizable reports, and efficiently enter the data through its well-designed user interface. You will successfully implement QuickBooks as your business accounting solution. You will be completely satisfied with my book and website. You will build a competent team of professionals. You will tell your partners and associates about my product if you find it useful. If you are not satisfied with this book, let me know within 30 days of purchase and receive a complete refund. Your satisfaction is important to me. That concludes the excerpt from the book, Chapter 1. Please read more on our blog, or more efficiently, purchase our training today to get expert assistance in managing properties in QuickBooks. Read happy customers’ testimonials ♥, skim through the training information, or watch the short video below. You’ll learn how QuickBooks can be easily, and correctly, set up for Landlords. Share a comment below, or read more on the blog. Ready to invest in your training? Order today risk free and download everything in seconds. Get your money back if not fully satisfied. Hassle free, no questions asked. Questions? Leave a comment below, or contact us at Landlord Accounting. I recently received a question from R.C. After reading your book How to Use Quickbooks for Rental Properties, I have a question about escrow accounts. I set up a mortgage payment of $5300 a month. $4400 is principal and interest and $900 goes to an escrow account to pay taxes at the end of the year. When I look at the escrow account the payments show as debits and the balance is a negative number. At the end of the year I do a transfer from the escrow account to the bank account and then pay the property taxes? The transfer from the escrow account shows up a credit. Can you help me understand why this is from an accounting point of view? The key is what type of QuickBooks account is the Escrow Account? Is it a liability, an expense, or an asset? Because you are accruing money in there that you will later use to pay an expense, it is an asset you own. 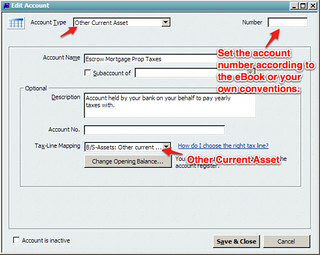 Thus, in QuickBooks create it as an Other Current Asset account type. When you do it this way, you will have the correct balance for your escrow. (If it were a liability account, it would show a negative balance). At the end of the year, you can record a Journal Entry for your total taxes paid from the escrow account, making sure to also record classes in all the line items. It is likely you would actually have several line items on this journal entry. One for each property. You have a choice to also create sub-accounts for each property under the escrow account. Generally that is not needed, but if you want it is an option for more reporting granularity. Like what you’re reading? Come back to LandlordAccounting.com’s blog or sign up to the e-course on landlording in QuickBooks. Order our full QuickBooks for landlords training today. When you’re a busy landlord using QuickBooks, you may just want to use QuickBooks and not have to think about journal entries, debits, or credits. And, generally the way we teach things, you can do that. However, sometimes it is very useful to think about transactions as Debits and Credits. “Accounts” are just a collection of transactions that sum up to give a current balance. There are always two kinds of transactions that come into play: a debit or a credit. 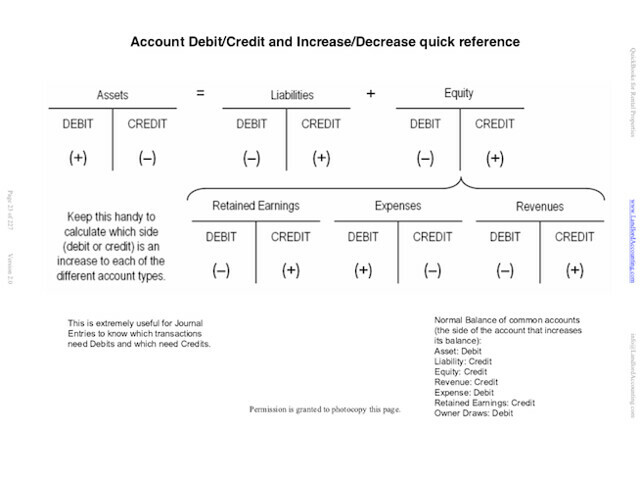 In the image above, you can see the shorthand notation used, a “T-account.” where debits are on the left and credits on the right. This is just the way accounting works. A cash account is an assets, and they increase with a debit; but liability accounts increase with a credit. The example transaction below shows the two accounts involved in creating a loan. It increases your cash, and increases your liabilities. In any given transaction the sum of all debits must equal the sum of all credits. Here 500 equals 500, perfect. The equivalent could also be a deposit like this. It is not a Journal Entry directly, but it creates one behind the scenes. You can verify the deposit creates the equivalent Journal Entry by opening up the Petty Cash register and highlighting the transaction. 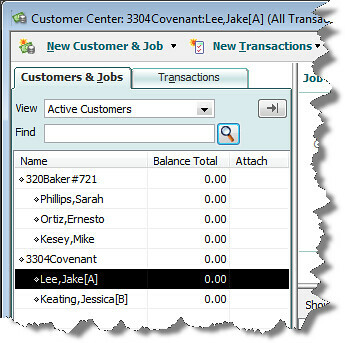 Then click Reports > Transaction Journal. In the mac version the following opens up. It’s equivalent for windows or online. Use this chart to help you remember if a Debit or Credit increases each account type’s balance. Extracted from page 23 of our training guide, the below graphic is a quick reference when you need to make a Journal Entry. Consult it to review which account increases by a credit and which by a debit. Read more about this is our free debits and credits excerpt from the eBook. Leave a comment with more details of what you want to learn about, or order our full training today. At least sign up for the newsletter on the bottom of the page. Opening Balance Equity is an account that QuickBooks automatically creates under certain circumstances, most commonly when creating a new account and setting an opening balance. How does Opening Balance Equity get a balance? 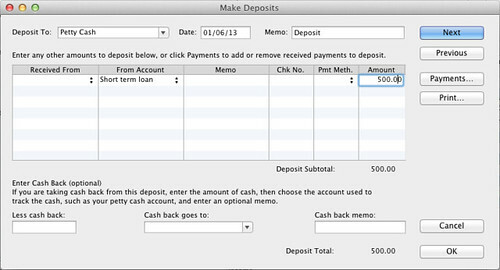 The following screenshot someone created a new checking account and set the opening balance here. That seems tempting, but it just defers the real work. (Later you’ll need to zero out Opening Balance Equity and record the actual account that gave this new account the opening balance.) The money came from somewhere else, so read below for the preferable way to enter all opening balances. It is an equity account, which means it sits alongside Owners Equity, Retained Earnings, Capital Stock, etc. You can see the current balance by looking in the Chart of Accounts, or click Reports > Company & Financials > Balance Sheet Standard. When Opening Balance Equity has a non-zero balance, you need your accountant to make end-of-year adjustments into other balance sheet accounts and zero it out. How do you adjust Opening Balance Equity to zero? It could be as simple as a two line item journal entry from Opening Balance Equity to the actual balance sheet account that “funded” the opening bank account balance. Generally, it is one journal entry, just sometimes many accounts are involved. Other times it is not that simple. There may be multiple sources of the Opening Balance Equity balance. And it takes your accountant’s help to correctly allocate them to the right accounts depending on which owner contributed them and whether they happened in the current, or a prior, year. If you only entered the beginning bank balance during the set up of the bank account in the chart of accounts, you may have a simple fix. 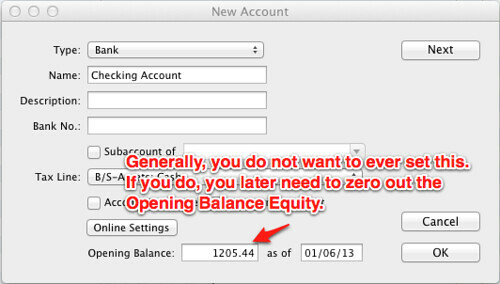 Quickbooks automatically offsets the amount in the Opening Balance Equity account. Since the beginning amount is generally from prior period activity, do a Journal Entry to retained earning to zero out the Opening Balance Equity. It could be that simple. Or, it could need to go to the member’s Equity account, or split among several owners. Recommended steps for creating a new company file, preventing any Opening Balance Equity. Start your journal entry with a blank line. For the Checking account, enter only the reconciled bank statement amount in that journal entry. 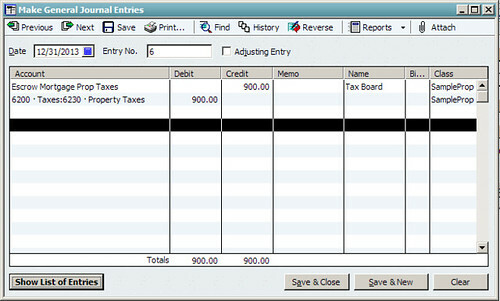 Enter all other Balance Sheet accounts except Accounts Payable and Accounts Receivable. Enter your Profit & Loss accounts. If you want your income/expenses by class, you can enter each year-end amount on a separate line in order to attach the class to it. (Following our training, you will want to do this for each property’s class). If you want your income/expenses by job, you can enter each year-end amount on a separate line in order to attach the job name to it. (As landlords, you don’t want to do this). Let the variance hit Opening Balance Equity. Then, enter any outstanding checks/deposits and hit Opening Balance Equity. (Use the write checks/make deposits windows). Then, enter Unpaid Bills and Open Invoices, one at a time with the vendor/customer name, offsetting Opening Balance Equity. (Use the enter bills/create invoices windows – you will have to set up an item which points to Opening Balance Equity for the invoices). When you complete these three steps, your Opening Balance Equity should be zero. This will give you the detail of outstanding checks/deposits so that you can reconcile next month’s bank statement. This, also, will give you an accurate A/P and A/R with enough detail to move forward in paying bills and receiving payments. Hopefully, the LandlordAccounting.com blog is helpful to you. Read more, or order our full training for Landlords in QuickBooks today.